Alastair Humphreys and Leopn McCarronn in Into The Empty Quarter. THE INTERNATIONAL Banff Mountain Film Festival returns to Galway on Tuesday May 26 to screen inspirational and exciting adventure and endurance films at the Town Hall Theatre. Galway is one stop on the festival's current 2015 UK and Ireland tour which will see 83 screenings in 55 locations of the best and latest films from the global mountain sports community. This year’s Banff Tour will feature paragliding through the Alps, surfing in the Arctic Circle, skiing in Patagonia, kayaking in British Columbia, and more. 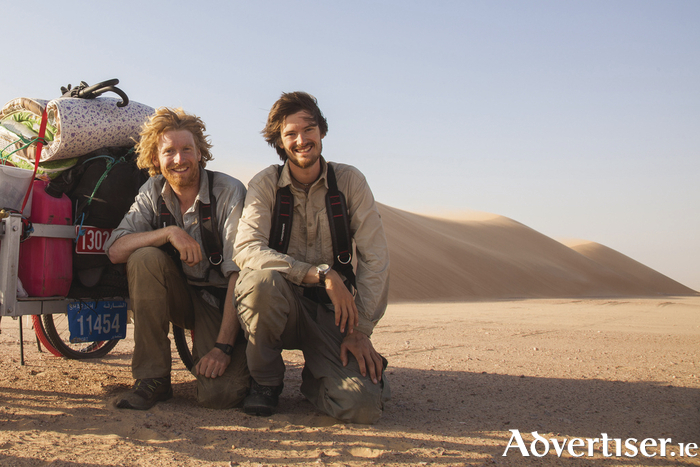 One of the highlights will be Into The Empty Quarter, following Alastair Humphreys and Leon McCarron attempt to journey through the world’s largest sand desert - the Empty Quarter of the Arabian Peninsula. Their trip is hastily-planned and low budget: unable to afford camels they instead hope to drag a homemade steel cart (filled with 300kg of supplies ) more than 1,000 miles through ferocious desert heat. Also look out for The Ridge, which follows trials rider Danny MacAskill undertaking a death-defying mountain bike ride on the notorious Cuillin Ridgeline in his native Isle of Skye. Drawn sees climber and artist Jeremy Collins embarks on four journeys - from the Venezuelan Amazon, to the China-Mongolian border, to the northern reaches of Canada, and to Yosemite Valley in California. Also look out for the inspirational story of Tashi and the Monk, brought to the big screen by film makers Andrew Hinton and Johnny Burke.